Are there hazardous chemicals at your job? Do you need basic OSHA Hazcom training? Do you need training in GHS requirements? If you are an employee who works with OR around chemicals, you need OSHA Hazard Communication and GHS training. The Occupational Safety and Health Administration (OSHA) Hazard Communication (Hazcom) Standard (29 CFR 1910.1200) also known as the “Right-To-Know” Rule went into effect in November 1985. Just recently, OSHA adopted the United Nations Globally Harmonized System (GHS) for labeling and classification of chemicals. The purpose of OSHA Hazcom is to communicate the hazards associated with workplace chemicals to all employees. Employees to be provided with information concerning hazardous chemicals through labels, safety data sheets (SDS), training and education, and a list of hazardous chemicals in each work area. NOTE: The deadline to be trained on GHS was December 1, 2013. Every employer to assess the toxicity of chemicals they make, distribute, or use based on guidelines set forth in the rule. Employees who handle hazardous chemicals and/or materials in their workplace are required to receive OSHA Hazard Communication and GHS training. These materials can include, but are not limited to: solvents, cleaners, caustics, flammables, and toxic materials. This online program is self-paced and has interactive exercises and quizzes to meet the OSHA Hazcom training requirement with GHS under 29 CFR 1910.1200(h). However, your employer shall be required to orient you to the types of chemicals used and the location of SDSs in your workplace. During your OSHA Hazcom training program you will receive feedback from Safety Compliance Management (SCM) talented Remote Instructors™ who are available to answer your questions and apply the material to your job, making it even more relevant. Safety Compliance Management, Inc., have taught major corporations, governmental agencies, the Lawrence Livermore National Laboratory, the Massachusetts Department of Environmental Protection (EPA) and authored one of the most relevant textbooks on the subject of hazardous materials response. SCM’s experience, in both working in and with a variety of industries dealing with occupational safety and other topics, makes them uniquely qualified to discuss OSHA Hazard Communication and GHS training requirements, along with California’s Proposition 65 Requirements and how they affect your business. 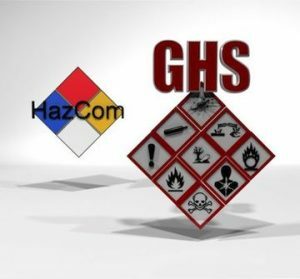 The structure and objectives of this online OSHA Hazcom with GHS course are centered around the requirements outlined in the OSHA HAZWOPER regulation, including the newly adopted Globally Harmonized System (GHS). Meet the requirements of 29 CFR, Part 1910.1200 for certification in OSHA Hazard Communication. Demonstrate an understanding of what constitutes a hazardous substance and the risks and hazards associated with them. Demonstrate knowledge of the use of Safety Data Sheets (SDS), GHS pictograms and labeling, NFPA labeling, DOT labels/placards, and other chemical labeling used at the site in working safely around chemical hazards found in the workplace. Demonstrate knowledge of the routes of entry for hazardous materials to enter the body, and of the effects that the specific chemical found at the site might have on people, property, or the environment. Demonstrate an understanding of the terminology used on an SDS including flash point, flammable range, carcinogen, mutagen, teratogen, concentration, incompatibility, PEL, and TLV/TWA. List proper workplace procedures to follow for the safe handling and use of chemicals including proper storage techniques, use of personal protective equipment, engineering controls, and spill containment/cleanup materials. Students may have to complete review sections along the way and a final exam at the end of the course. You will need a computer or iPad with Internet access and an email account. No text is required; all course materials are available online. The course will take approximately 2 hours to complete.